I had just attended an Alfred Hitchcock film festival at the Vista Theater in Hollywood. Within 48 hours I had seen at least three films with Stewart that were completely new to me. I was overwhelmed, just floored by his performances, but mostly by his amazing persona. It was a transcendent experience, and I felt at that time that I had - HAD - to meet him. 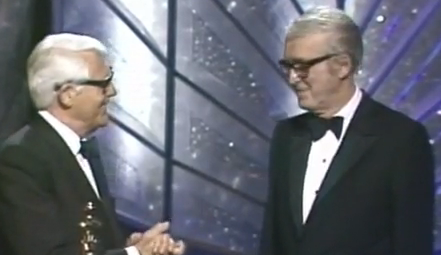 This feeling was quite acute because I had recently seen him either give or receive a lifetime award with (or from) Cary Grant, so I thought I had better act quickly (Stewart was sturdier than I imagined, and would go on to live another decade, passing away at 89 in 1997). So, in my youthful naivete, I embarked on the adventure of meeting him, and I was pretty sure I knew how to do it. I hit up one of those people who used to sit around Sunset Boulevard selling maps to the stars' homes. It was disturbingly easy to find his house, and moments later I was parked in front of his two-story Beverly Hills home. Unbelievable. I realized I'd come unprepared with a picture for him to sign, but in my glove compartment had a novelty postcard with Alfred Hitchcock sporting a cigar in his mouth with a crow sitting at the end of the cigar. Typical of him, right? Perhaps a little strange to hand to Mr. Stewart, but maybe it would make for a conversation piece. So I marched up his walk and knocked on the front door. Waited. Then the little wooden "security" door opened and a housekeeper peered out at me. I asked if he was there, she said no (she didn't speak much English) but I understood that he would be back soon. I slipped the postcard through the mini door, saying I hoped he could sign it - do you see what I was doing there? I said I'd be back. Forty minutes later I returned, knocked, and he himself opened the little door this time. I quickly mentioned I was the one who dropped off the postcard, and he said, "Oh, okay, come in" in that familiar drawl. He swung open the door and was already walking toward a small table where my postcard was. I then walked into Jimmy Stewart's house. I could see straight through the house to the back glass doors and see a lot of green grass beyond. It was one of those older, quite spacious houses in Beverly Hills with ample land. But I didn't notice much more, not with the legend standing in front of me. Just to recap: I first saw his fairly luminous visage through the small opening when he casually opened the door. I then saw his crooked body casually walk over to the table. He was so matter-of-fact it was disquieting. I was so unprepared for how smooth and casual he was that I mentally kicked myself for not being better prepared with more stimulating conversation. He looked up from the card to ask my name, signed it and handed it to me. All I could think to ask at that point to prolong the encounter was that old hoary standby, "So what advice would you give writers trying to break into the business?" "Well, what I always tell actors is just work at your craft. You keep doing that and you'll get in." Or something very close to that. Then I asked if I could use the restroom. I know, it's horrible, I was young and dumb and I thought it would be part of a good story later... I don't know. Anyway, he was gracious, and pointed to a door in the foyer (which we never left) that I hadn't noticed: a small bathroom was inside with nothing anyone would find value in stealing. Obviously I was not the only one who made this pilgrimage and asked the same rude question. He'd had the bathroom installed for folks like me, enabling him to be the eternal gentlemen without unnecessarily disturbing his life. I think I just washed my hands, came out. He was still there, so I thanked him profusely, we shook hands, and he saw me out. He was frail, but there was no denying his spirit or his familiar charming manner. This was Jimmy Stewart, and he made me feel that my visit that day was okay by him. I'm glad to have the chance to reminisce about it, because it's great remembering such a special person. And of course, he keeps giving, in his immortal films that will live forever. This article with written by guest Kid In The Front Row writer SCOTT MICHAEL, from LA. In late 1973 I was operating my very first restaurant, Merlin's Tower, a small pizzeria and sub shop on Transit Road and Wehrle Drive, on the eastern edge of Buffalo. Around dinner time the phone rang and the caller said, "I'd like to order a pizza and I'll have a driver come and pick it up". 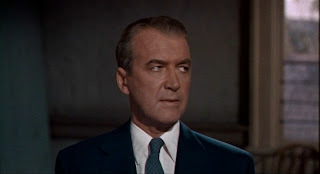 I recognized that unique and unmistakeable voice instantly; it was Jimmy Stewart. He ordered a large pizza with double cheese, pepperoni and mushrooms - mushrooms on half. I might have put that pizza together with just a little more attention to detail than I usually did, but it was pretty much the same pizza I made for anyone. The driver came and picked the pizza up but the driver didn't know who it was for and I told him it was for Jimmy Stewart, one of the most famous movie actors. That's not the end of the story, though. About an hour later Jimmy Stewart called me back, and he said "I just wanted you to know that that was the best pizza I ever had, so thank you - thank you very much." I chatted with him for a moment; he and Gloria were in Buffalo because one of his close relatives had passed on, and they were there to support the family. I can still hear Jimmy ordering that pizza and thanking me for it these forty years later now, in 2013.